1Preheat oven to 350 degrees. 2Season Dover sole fillet with salt and pepper to taste. 3Lay the fish on a 12″-18″ piece of aluminum foil, then fold the side to create a tray. 4Pour Tantillo Extra Virgin Olive Oil over the top of the fish. 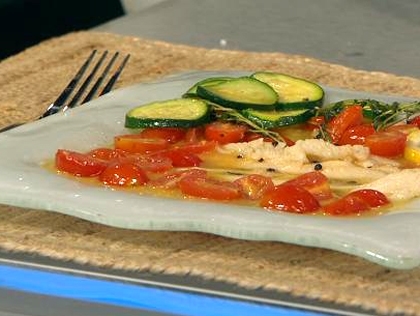 5Lay zucchini slices, halved tomatoes and thyme atop of fish. 6Cover fish by closing the sides of the foil over it. Cook in oven for 7 to 8 minutes. 7Drizzle with Tantillo Extra Virgin Olive Oil and place lemon wedges on top. Serve and enjoy. © 2019 T&M Imports. All Rights Reserved.